Interesting and important conversations are taking place in America. Critical and challenging thoughts are being entertained in a serious way by many Americans for the first time in a good long while (if ever). We are now being forced, by the grace of God, to consider what it means exactly to worship and what it means to have liberty to worship in a land like America (or any other in His creation). We are being forced to choose between a thoroughly satanic – and very All-American – approach to the concept of religious liberty, and a biblical approach to the same. We are being forced to choose this day whom we will serve and worship – and who we will allow to be openly served and worshiped – in America. Put another way: We are being forced to “test all things”, including our most cherished traditions and thoroughly engrained assumptions about patriotism, freedom, worship and liberty by the pure light of the perfect Word of God. And what we are being shown by in that perfect Light is hard. Very hard for us as proud Americans. The subject of “religious liberty” is now front and center in the minds of many Americans. And before we get to the bad news, let’s add a little more good: More and more Christians are finally beginning to awaken to the reality that the “religious liberty” concept they’ve been pitched, sold, and led to embrace as good, patriotic, “conservative Christian” Americans for their entire lives is, in fact, a lie. A thoroughly satanic lie, to be more precise. 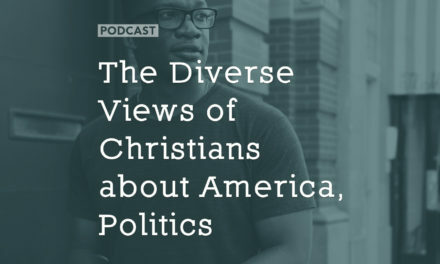 The bad news is that the vast majority of politically active “conservative” professing Christians are still very much ensnared of this lie, to the point that they adore it, cherish it, and vigorously defend it any time it is criticized, even when criticism brought in perfect harmony and accordance with the Christian command to “test all things” and “take every thought” – including every political, legal, and governmental thought – “captive to Christ” (see: 1 Thessalonians 5:21 and 2 Corinthians 10:5). Yesterday I had the opportunity to visit a “religious liberty” rally and mingle with folks there. These are “my kind of people” in so many ways and I sympathize with ’em on many levels. passionately so. This is what makes it so very painful to see so many professing Christians coming together not to stand for biblical religious liberty, but rather for the satanic counterfeit. This is what makes it so heartbreaking to see so many Brothers and Sisters still profoundly misled and misleading others to actually and quite vigorously champion the “right” of a Satanist to worship Satan in America. Ask the typical professing Christian “conservative” at one of these events if we as Americans have and must vigorously defend the right to worship any god we like or practice any religion we like, and they will heartily amen while waving their flag…the flag of their true god in practice on the subject of religious liberty. 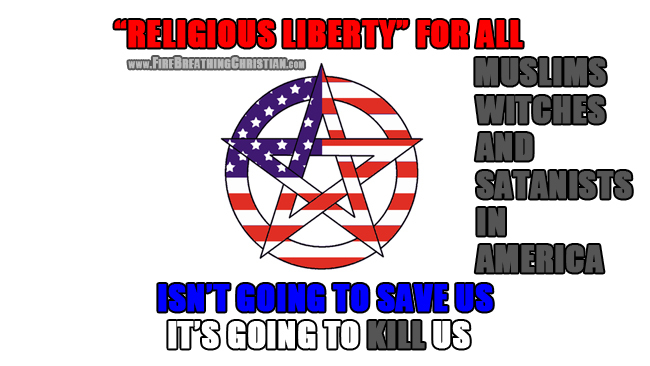 This “liberty”, they will almost always admit, must, of necessity, cover groups that we may not like or with whom we may disagree…like Islam and Satanism, for example. Which “god” would presume to grant and encourage vigorous defense of the “right” to openly worship these false gods? But nobody in America seems to notice, much less care. That’s how far we’ve been led down the path of America as god in practice and unthinking patriotism as our preferred religion. So the rallies go on. Throngs and throngs of “conservatives” gather to passionately proclaim and defend the “right” of Muslims to openly worship Allah and Satanists to openly worship Satan in America. With “American Christians” leading the way, as usual. PreviousIs True Religious Freedom a Thing of the Past?